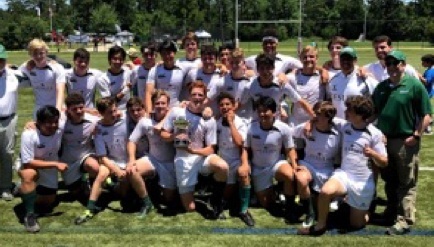 Six Western Old Boys, Josef Schmidt (Raven 2014), Alvaro Directo (Green 2015), Joey Figueroa (Green 2015), Matthew Granberry (Raven 2015) and Pablo Granados (Green 2017) competed on the Strake Jesuit Varsity Rugby team, winning the D-2 Texas High School State Championship. Boys fought hard and battled back victorious over opponent Timber Creek HS from Fort Worth. 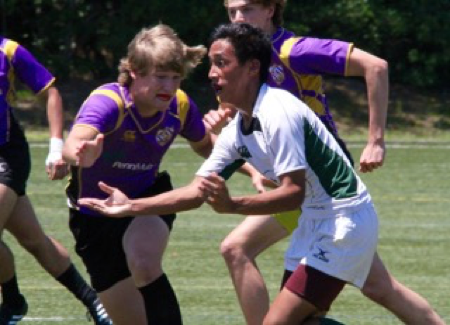 Trip Twardowski (Shell 2016) also played Varsity and JV rugby this year, and Chris Hoekel (Green 2017) played JV rugby at Strake. We are proud of these young men and kudos to Mr. Monks and Mr. Creech for lighting rugby fire in these guys! Alvaro Directo battles toward Rugby championship!